ZTE released a new 4G Wireless router MF253 in August 2013, which can separate the 4G technology and transfer data between 32 instruments in the workplace or home. The MF253 4G LTE Router provides input data at up to 100Mb/s and the transmission speeds of up to 50Mb/s, sending a signal up to 32 units network working in an office or home. With its modern, upright design, noninvasive white casing, LED signals clearly presented the network connection status. The fashion design of ZTE MF253 fits both the office environment and private space use. The company ZTE has provided special versions of the router MF253 adapted to the different requirements of LTE spectrum present in the markets of America, Europe and China. In addition, the manufacturer ZTE has equipped the device with an external antenna that will help you get better call quality and a stronger signal in urban areas of weak network coverage. Implemented MIMO (multiple-input multiple-output) makes many users simultaneously receive a good quality signal through ZTE MF253 Router. For your convenience, the router MF253 is equipped with USB ports, so it can serve as a central information office, when connected to an external storage drive. There are two ports in the device, one RJ 41 for WAN and RJ45 for LAN. 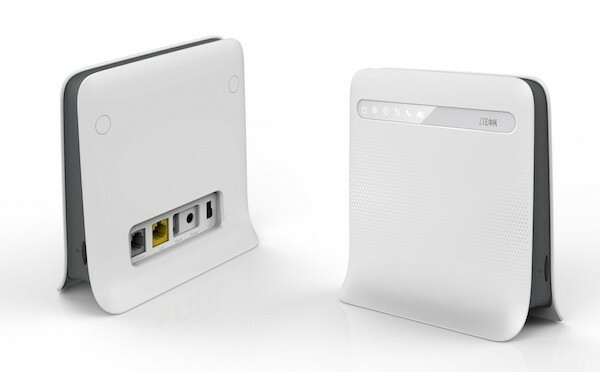 Based on the pure 4G technology, we believe the ZTE MF253 is a good and reliable 4G Router for wireless connection.